Individual electrical circuits are protected by fuses. Find out which fuse belongs to the component that is not operating » page 167, Fuses in the dash panel or » page 169, Fuses in the engine compartment. Take the plastic clip out of its fixture in the cover of the fuse box, place it on the relevant fuse and pull it out. 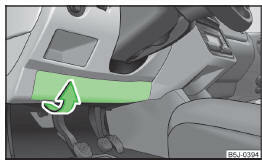 Always read and observe the warnings before completing any work in the engine compartment » page 139. “Never repair” fuses or replace them with a fuse of a higher amperage – there is a risk of fire. This may also cause damage at another part of the electrical system. A blown fuses is recognisable by the molten metal strip. Replace the faulty fuse with a new one of the same amperage. We recommend that you always carry replacement fuses in the vehicle. 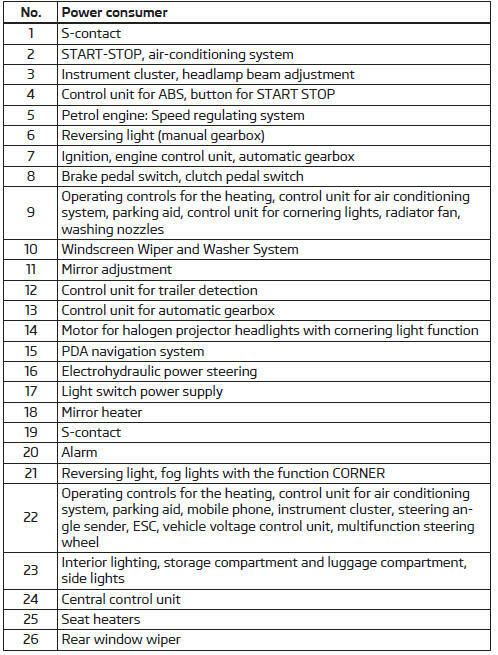 A box of replacement fuses can be purchased from ŠKODA Original Accessories. One fuse may cover several consumers. A single consumer may use several fuses. Fig. 150 Underside of the dash panel: Distribution board cover. The fuses are located on the left side of the dash panel behind a cover. Carefully remove the cover in the direction of the arrow » Fig. 150. After the fuse has been replaced, replace the cover in the dash panel in the opposite direction of the arrow so that the guide lugs are guided into the openings of the dash panel. Close the cover until it clicks into place. Fig. 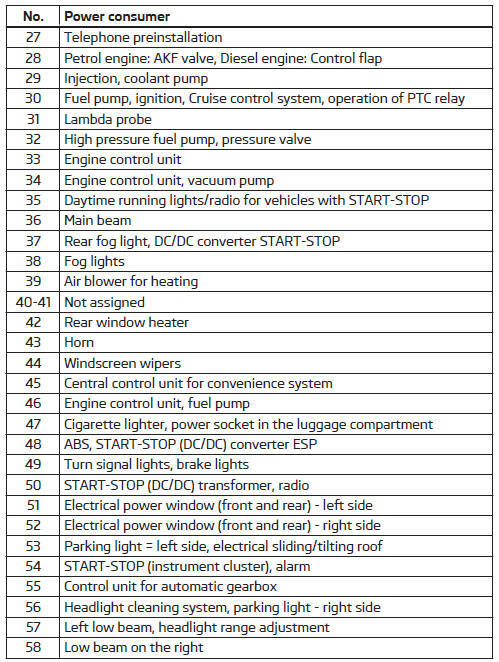 152 Vehicle battery: Distribution board cover. 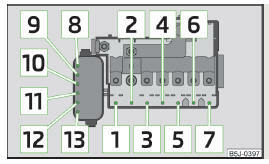 Press the securing clips on the fuse box cover together at the same time in the direction of arrow A » Fig. 152 and remove the cover in the direction of arrow B . Release the fixtures in the openings C using a flat screwdriver and fold the cover upwards in direction of arrow D .
Fuses 1-7 are replaced by a specialist garage.